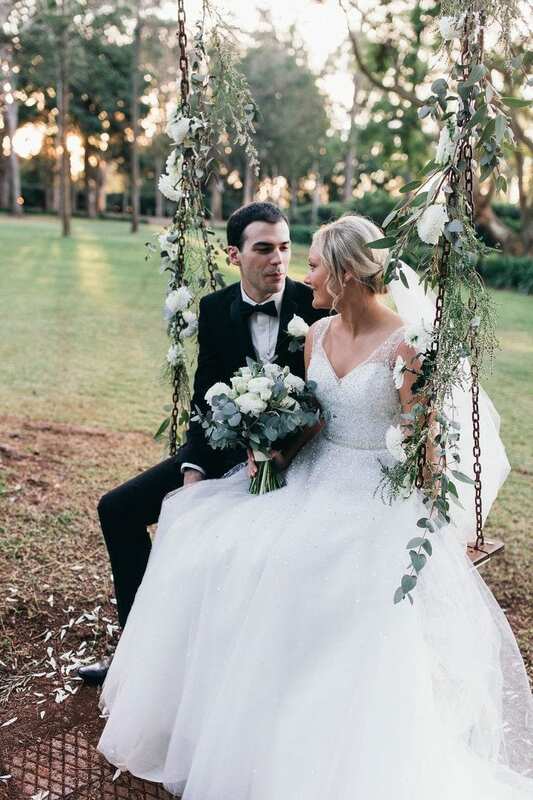 Kara-Lea & Michael’s elegant homestead wedding day was set in the heart of Toowoomba at Gabbinbar Homestead. Surrounded by manicured gardens in this Heritage Estate, the two wed in an intimate ceremony outdoors followed by an elegant reception in the Conservatory. Kara-Lea glowed in Greta by Mori Lee. A tulle ballgown with a V neckline and elegant low back finished with a cascade of crystals that shimmer and shine. Additionally, Kara-Lea paired her gown with an understated raw edge veil and not-so-understated Valentino heels, completing the look. The overall theme was pared back with neutral florals and greenery including Australian native foliage. A concept beautifully executed throughout the event from the table centrepieces to the details on the naked wedding cake. See all the beauty from this dreamy wedding below.